Quality Second to None and Guaranteed! 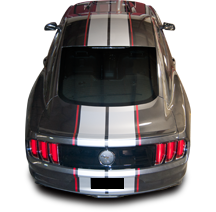 Custom Auto Designs vehicle specific graphics give today's muscle cars and trucks the classic styling of yesteryear. 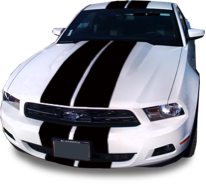 Hood graphics, body line graphics, rocker stripes, quarter panel accents, and bed stripes are available for late model cars and trucks from domestic and import manufacturers. While not all these graphics were designed by the manufacturers, all the Custom Auto Designs vehicle specific graphics have the OE look. Custom Auto Designs graphics are available in 7-2mil stock colors, 7- Avery Supreme Wrap colors and Carbon Fiber. Black, Silver and White are classic subtle colors used by the OE manufacturers based on the exterior color. 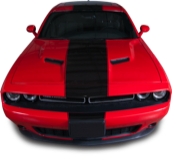 These colors give the vehicle a tasteful contrast to the paint, while maintaining the muscle car styling. Orange, Cardinal Red and Intense Blue add a splash of color for those who want to stand out. Custom Auto Designs graphics can be special ordered in a multitude of colors or custom sizes. Pink, green, yellow, or purple, just about any color you can think of is available with a small up-charge for custom colors. Need us to alter the size of the graphic for a specific application? We can change the sizing to whatever specification you might have. Sizing changes also have a small up-charge based on amount of time needed for the re-sizing. Graphics that have names or numbers in them can also be changed to whatever lettering is needed for the job. Custom Auto Designs stock graphics are made from Universal Products 2 mil Hi-Performance vinyl. This cast film features dimensionally stable performance, and a durable acrylic adhesive. 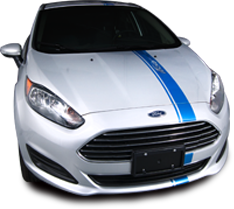 This vinyl is great for side graphics but is not warranted for hood, roof or deck lid applications. 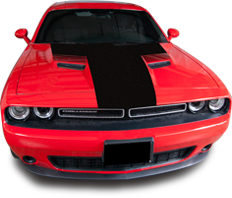 Check out Avery Supreme Wrap for the perfect solution on these applications. All of Custom Auto Designs graphics are packaged to make sure your graphics aren’t damaged before they are installed. Large graphics are packaged in durable cardboard tubes, and smaller graphics are packaged in protective chipboard boxes to keep your graphics from being damaged in either transit or storage. 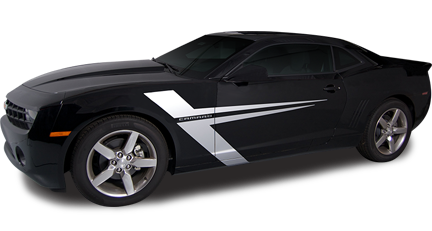 All of Custom Auto Designs graphics are available in Avery Supreme Wrap film. ASW vinyl is the only vinyl available with a 3 year warranty on horizontal applications. 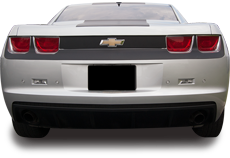 ASW vinyls may cost a little more, but it is the perfect solution for hood, roof and deck lid applications. All Custom Auto Designs graphics have Restylers’ Choice 36-month warranty. You can install our graphics with the confidence that you will be backed by the manufacturer. 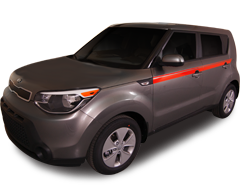 All horizontal applications must use Avery Supreme Wrap vinyl to be covered by our warranty. A sample of the vinyl and/or pictures may be required to validate any claims.